Sorry blog-readers part two of this blog has been so long in coming. I’ve been immensely productive on our book series. 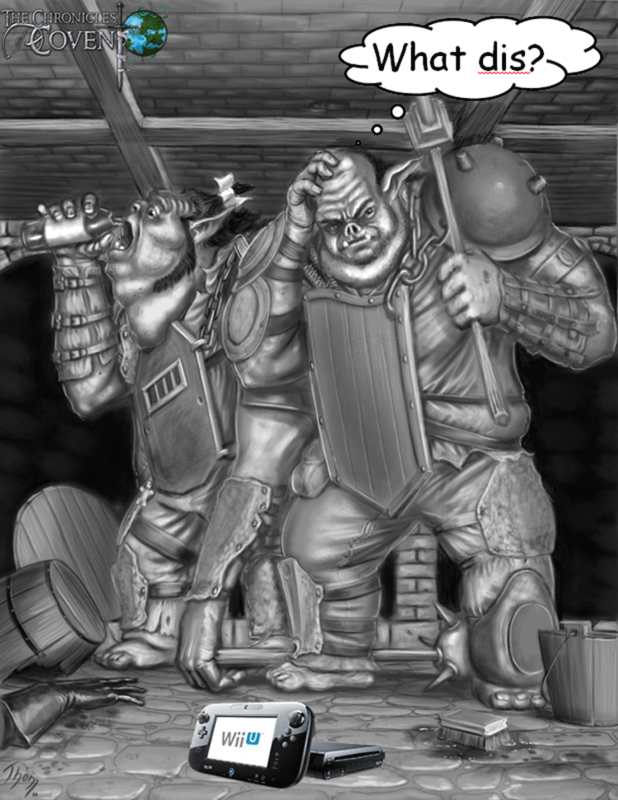 I completed two full proofing runs of Shade II, seven more chapters of Elf Wars, three totally new chapters of the finished book one of Adventure Series and even six full chapters of the completely overhauled Triloriad. As result, the importance of my ranting on the Wii U felt small by comparison. That said, let me jump back on the whine wagon. There is no doubt that Nintendo has some of the strongest video game franchises of all time and makes some of the best games in the world. I just don’t understand why they can’t just embrace a technology they made last generation and simply pour all their energies into making epic Mario, Zelda and Metroid in glorious high definition. I do not want to play another Zelda game without Skyword Sword motion control! I don’t care if link’s menu now appears on a little screen on my controller. I want to wave my sword around like Link!!! Right now I feel like Nintendo is its own worst enemy. The Big N is infected with a major case of “out-do-itis”. Instead, of releasing a major epic Nintendo franchise at launch I feel like they’ve spent too much time trying to come up with the next revolution in gaming. The E3 coverage was highly disappointing because Nintendo didn’t unveil what everyone was really waiting for…a high definition Mario Galaxy, Legend of Zelda or another mega launch franchise. Instead, we get Nintendoland. Whoopie! I can now shake my blocky controller like a Japanese tourist with my grandma in high definition! Again, why am I not playing Mario or Zelda with traditional Wii controls in glorious high definition? Of course, I will acknowledge that there is a time and place for motion control. Some Wii games got too gimmicking trying to incorporate actions that simply can’t be done naturally with a Wii controller. Like kicks or headstands or cartwheels or bellyflops, but the Classic controller, classic NES style among other control schemes provided a wide array of options. Right now Zombie U is one of the only Wii U games that looks like it has some good ideas on how to incorporate the Wii U controller. That said, my biggest turn off is that I’m going to have to aim this clunky Wii pad or an analog stick at the screen to shoot zombies. I’m a Japanese tourist again…say cheese, zombie! My biggest fear is that Nintendo’s latest toy will distract Third Party Support from making some truly awesome high definition motion control or point and shoot games. Third Party Developers already shied away from the original Wii because as one of their toothy programmers put it, “Nintendo just took two Gamecubes and stuck them together with a roll of duck tape.” Ok, so Wii U has some power under the hood. So developers can finally make some hi-def games, but the last thing I want them to do is to try to incorporate the new controller into everything just to please Miyamoto. Then if third party sales don’t come in because we tried to mold the game to the controller instead of the controller to the game, they’ll back off the Wii U entirely. Third Party Support was such a glaring issue on Wii I don’t think I’ll be able to run out and buy a Wii U before I see how well they support the Wii. This puts me in a one to two year post launch window for even thinking about buying a Wii U. Pretty much all the groundbreaking third party games were made on Playstation 3 or Xbox 360 because, and I cough, the Wii’s graphics sucked! Even though the Wii outsold both the PS3 and the 360, it was largely ignored by third parties. Another of my biggest complaints for the Wii was the HORRIBLE online experience. While the 360 was rocking a far more customer friendly Xbox Live, I was still stumbling around trying to enter Friend Codes. Worse, Wii didn’t even get a fraction of the online options available on other systems. Entire game expansions, free downloads and customization options GREATLY enhanced many of the game releases on other systems. People were playing and replaying the games they loved through new downloadable content and I was still trying to type in that pesky friend code! I’d hate to admit it, but I am still a wrestling fan. Yes, I know it’s fake, but for some reason I am drawn to the flashy muscle-headed soap opera known as professional wrestling. Sometimes even more than watching wrestling, I enjoy a good highly customizable wrestling game where I can make my own feuds and have greats clash across impossible intergenerational lines. WWE on Wii not only had worse graphics, but it also ALWAYS left out a lot of content that was included on PS2 and 360 counterparts of the same game. It also had NO customization options outside what was included on the disc itself. It had no downloadable packs to download new wrestlers. It had no way to download other gamer’s CAWs (nerdy way to say player created wrestlers). It had no way to upload custom music so my Goldberg or NWO CAWs could actually come out to their real life theme music. Ugh! The bottom line is that I’m not going to run out and buy a Wii U like last time. I appreciate that the Wii controllers are still compatible with the Wii U, but I’m going to wait and see if programmers bother to still make games for the truly innovative motion control scheme. If Nintendo ignores the original Wii controls, I will ignore the Wii U. If third party Wii U sales fail because they spent too much time trying to make games for Nintendo’s latest gimmick, I will ignore the Wii U. If third parties cannot compete on Wii U due to Nintendo’s super franchises (I have play a thousand times), I will ignore the Wii U. If I cannot download packs or CAWs or upload custom music to my Wii U wrestling game, I will ignore the Wii U. To find out more about us check us out at the www.chroniclesofcovent.com. Next blog will be Covent centric and the entry after that will be an Author Interview with my special guest, Michael Patterson, the author of a killer new super-hero title called Freak.